The following conditions are translated from German into English. The German original is binding. Following conditions are only subject of the trading between traders defined by the German code of commerce, legal entities or public assets. These conditions do have antecedence of any different terms of conditions by our customer. This Agreement may NOT be altered, supplemented, or amended by the use of any other document(s) unless otherwise agreed to in a written agreement signed by both you and TST electronics GmbH. In the case that TST electronics GmbH is doing installation or maintenance, other then supplying goods, the terms of installation or maintenance are effective. 1. Our offers are always without commitment. The offer has to be seen legally as a request to commit an offer. A binding is only accepted by the TST electronics GmbH with a written confirmation. 2. The description of the scope of supply or our service is within the confirmation. Changes need our explicit confirmation. 3. We do not take any responsibility of the accuracy of any technical data, prices, or other offers of third parties unless we explicit refer to them. 4. Technical changes due to technical progress, basics enhancement which do not interfere with the general designed purpose are possible and might happen without notice. 1. All prices are delivering ex works and excluding package. Package will be charged with the cost price. 2. Our prices are daily list prices, based on current component costs for materials, wages and overhead costs. If, in accordance with the agreement, delivery takes place more than 4 months after conclusion of the contract and if costs have changed since the day of ordering, we are entitled to invoice using current list prices. 1. If not otherwise in written form agreed, initial payment is owing or a part payment for delivery or progress in construction, all payment are due to pay by receiving an invoice. Payment has to be done within 10 day after receiving the invoice and without discount. 2. The payment has to be done by cash, check, bank- giro or postal- transfer. Discount, collection charges, interest and purchase tax are debits of the ordering party. 3. If the ordering party do not fulfil their obligation of payment either partially or in whole the ordering party is obligated – irrespective of their legal rights- to pay 1% interest of missing balance per month. As far as it is possible to agree on an interest payable from the due day, the same amount will be effective. 4. If the ordering party is in delay with the payment, stopped the payment, is over-indebtedness, an ongoing insolvency is in place or the ordering party do not fulfil their obligation to answer a bill of exchange or a check, all outstanding payments become due. This also came effective if the economical base of the ordering party is declining. If there is a significant declining in economic base of the ordering party, we are entitled, by our choice, demand payment in advanced, tender of securities regarding our claims of all existing contracts and deny the fulfilling of our part of the contracts until all payment has been made. If the ordering party does not fulfil either the payment in advance, or any security payments are in delay, we are entitled, in an adequate time, to withdraw from the contract and to demand compensation for the loss suffered. 5. The summation of mutual factoring is not allowed unless – defined by law – the summation is with payments beyond any dispute or with legally accepted. Also lien is not allowed as far as they do not ground on the same contract. 6. If the ordering party is entitled, because of faulty performance according to chapter VIII, with guarantee claims, so the ordering party has the legal right to withheld a legal sum only in the amount which is the equivalent to the outstanding performance, of their payment. This right is obsolete if we accepted the guarantee claim and shown or made a bank guarantee in an equivalent amount. 1. If the ordering party have to pay a deposit or bring a certification of the securing the payment, the agreed deliver time will start at the time where the ordering party fulfils its obligation. A further premise for the beginning of the deliver time is that all certifications and necessary documents are shown by the ordering party as well as all obligations to co-operate. 2. The delivery time is adhered if the goods are ready for delivery at expiry of period. 3. The delivery period is extended if the customer later wishes some changes. 4. Unforeseen obstacles, which are not caused by us, like force majeure, official interference, strikes, vandalism or a business disruption of any kind, a delay within the supply, if the goods are ordered in a verifiably adequate time, or cause by a lock out during a labour dispute are resulting in an appropriate extension of the delivery time. The mentioned reasons are also not to argue by us, even if already a delay in the supply exists. 5. Part delivery is allowed. We are only liable for compensation to the ordering party if we are causing the delay deliberately or through gross negligence. If we act by negligence the ordering party is entitled to a compensation of max. 0.5% of the damage cost for every full week of delay up to a maximum amount of 1% value of the missing part delivery which in consequence of the delivery delay is not in time or appropriate used. The right of withdrawal, chapter IX, stay unaffected. 1. The peril for the delivery goods is devolving to the ordering party at the same time the goods are leaving the factory premises, even if we are sending a part delivery or we, for example, paying the shipping cost or the delivery. 2. If the reason of a shipping delay is caused by reasons the ordering party has to argue, the peril will be transfers to the ordering party with the date the goods are ready for shipping. 3. Delivered goods have to be accepted even if they show minor deficiencies or they are delivered partially. Legal rights of the ordering party, remains untouched by our liability for defects. 1. After direct issuing an invoice (as well a pay on account) to withheld our service as long as the ordering party adduced the owing payment. 2. After setting an adequate additional respite to withdraw from the contract or demand regress due to the failure to fulfil obligations. 3. In the case that the loss is not higher then 15% of the contract amount, there is no obligation for us to proof the loss. The ordering party reserves the right to proof that there wasn’t either a loss or the claimed loss was significant lower than agreed on. 1. All delivered goods will remain our property until they are paid for in full (payments by acceptance or customer’s papers until they are completely paid for in cash, also prolongation) including all claims out of a current invoice and including all possible interests and costs. 2. For the case that the goods were already being worked on or been mixed with other goods which shares cannot be determined anymore, or for the case that the goods are being used as accessories for other objects, we are entitled to own also the new good. The new is viewed to be conditional good. The German § 946 Abs.2 BGB (German Civil Code) does not have a legal effect in this case. 3. Every pawning or safety transfer of reserved goods to the benefit of a third party is impossible without our written permission. The customer has to inform us immediately if these goods are being pawned by third parties. 4. Reselling of goods before they are completely paid is only permitted to resellers in a normal business way though it should be noted that the property to our favour is also expressively reserved against third parties. On demand the customer is to forward us an exact list showing the transferred claims with details of third party debtors, amount of claims, dates of invoices etc. and on our demand to change these quiet transfers to open ones. 5. For the case that the goods were already being worked on or were mixed with other goods which shares cannot be determined anymore, or for the case that the goods are being used as accessories for other objects, the claims against third parties following a resell with the amount of the invoice for the goods which were delivered by us will be transferred to us for safety reasons. On demand the customer is to forward us an exact list showing the transferred claims with details of third party debtors, amount of claims and date of invoices etc. and on our demand to change these quiet transfers to open ones. All costs resulting on an interfering has to be paid by the ordering party. 6. In the case that the conditional goods are mixed with an estate of the ordering party, becoming a mostly part of an estate, so the ordering party assign, if he has the rights of a rent from this property, for security reason, the rent with all ancillary right to us. 7. If the value of all of our security claims, against the ordering party, is higher then 25% of the security amount then the ordering party is entitled to inform us about the claim we have to release. 8. If the ordering party is ordering software, all copyrights stay with the TST electronics GmbH. The ordering party is not entitled to modify and/or multiply the software. 9. The ordering party, its assistance, freelancer and subcontractors who are involved in this project are strictly forbidden to analyse the software, to reassemble, reengineer or to make changes of any kind. All kinds of reengineering of the development processes or the translation into other code forms are strictly forbidden. 10. Every attempt or reengineering the development processes, the changing of the code or an illegal emulate or copying of the ordered software or their Key files results in an immediate cancellation of the contract and contract penalty of 100 000.00 €. 1. The delivered good has to immediate examined after arrival. Obvious defects, as defined in the German law under § 377 Abs.1 HG, has to be directly indicated to us. After discovering defects the using of the goods have to stop immediately in order to avoid further more damage. 2. The ordering party is liable to check all functions, either hard or software in the native area of the ordered software. The ordering party has also the liable to check after receiving the data carrier, the printed or not electronic documentation for defects or errors. 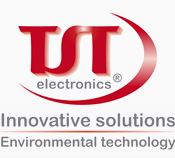 If there are any defects, TST electronics GmbH has to be imminently informed in written form. The information must be detailed and show under which circumstances the failure appearance. 3. In the case a failure has to be reproduced or localised, all data or information has to be given us free of charge. 4. Before installation the new software or hardware, the ordering party has to do sufficient security measures. This includes the operating system, already installed software and the data contained on that computer. Effected computer are all devices where the software, in hole or in parts, is installed. 5. In the case that the software is incompatible with already existing software there is no legal right for compensation. 6. Our liability applies only to defects that appear under the conditions of operation provided for under the purchase order of ordering party and under proper use. In particular, it does not cover defects arising from faulty maintenance or installation or wiring or from alterations carried out without our consent in writing, or from repairs carried out improperly by any third party, nor does it cover normal wear and tear. A basic principle for all products delivered by us is: only qualified personnel (like defined in the German Safety Regulation (BetrSichV) is allowed to assemble, mount or to put in operation. We only provide a part warranty. Our liable exclude natural abrasion, damages as a result of faulty handling after the transport of peril, faulty initiation by the ordering party or a third person, faulty or careless usage, heavy demands, improper working environment, faulty work, faulty construction work, chemical- electrochemical or electrical influence. We are not liable for any service work on-site. The warranty expires if there will be any changes or repairs, made by the ordering party or a third person without our approval, on our delivered goods. 7. Replacement parts have the implied warranty. New parts have a 12 month warranty after date of commissioning but not exceeding 15 months after date of delivery. 8. As far as there is a valid warranty claim, we are obligated either to repair the faulty parts or, by our choice, to replace it with a part free of defect. 9. To undertake all necessary repairs and delivering, the ordering party has to provide us with the necessary time. Is the necessary time is frame denied, we are freed of our warranty liability. 10. In the case our delivery contains goods which are made by a third party, we reserve the right to transfer the warranty rights, which we are entitled of from our supplier, to the ordering party. In this case the ordering party is not allowed to demand any warranty rights from us unless he has proven that it is impossible or not reasonable for him to enforce the warranty rights out of court. We are supplying the ordering party, on his demand, with all necessary information to enforce their right for the transferred warranty. 11. We are entitled to deny, without any legal disadvantage, the solving of a fault if the ordering party withheld a payment which is not reasonable neither proportional to the caused failure. 12. If the delivered good is either used, not refurbished by us, we exclude every kind of warranty. 13. We do not accept any further pertaining of the warranty for any negligent. In particular the ordering party has no rights to demand a compensation for proximate or constructive damage. The only exception is, if the claim of compensation is founded on an assured feature. In this case – if the incorrect assured feature is made on purpose or grossly negligent by a legal agent or an executive employee - claims of compensation for proximate or constructive damage are excluded. 14. For grossly negligent or purpose we owe the ordering party, by law, compensation providing we are responsible for the grossly negligent or action done on purpose. The compensation for atypical and unforeseeable damages is limited to the contract volume. 15. The ordering party shall provide on its own account and risk after sale services. 1. If it is impossible for us to carry out our incumbent performance the ordering party is entitled to withdrawal from the contract. If performance is partially impossible the ordering party is only entitled to do without a partial performance is not in the interest of the ordering party. In case the impossibility happens because of a delay in the acceptance of the ordering party or because of a guiltiness of the ordering party, the ordering party is bound to offer an equivalent. 2. If we are in failure to meet an obligation of delivery and the ordering party is already granting an appropriate delivery time extension, according to the German §326 BGB (German Civil Code), with an explicit statement that the ordering party will not accept the delivery after the end of the term and if the new time limit is not kept by our fault, the ordering party is entitled to withdrawal from the contract. In case of unforeseen events, in terms of chapter IV 4., which have an economical significance or the substance of the delivery changed considerable or have a remarkable impact on our company we do have the right to withdrawal from the contract. In the event we want to use our right of withdrawal we do have the obligation to announce this to the ordering party directly after discovering the consequences of these actions. This obligation remains also if there is an agreement for an extended time limit for the delivery. An indemnity claim pro the ordering party does not result out of these actions. 1. In the event of full or partial impossibility we shall be liable to pay damages to the ordering party in accordance with statutory requirements, provided that wilful acts or gross negligence can be proved against us. If impossibility is based on slight negligence, the claim for proven damage shall be limited to 5 % of the counter-performance agreed with the ordering party for the relevant part of the performance. If the ordering party is a trader, damage claims for slight negligence are excluded. The same shall apply to gross negligence, unless such negligence claims are pursued against our legal representatives or senior executives. 2. The ordering party is not entitled to demand damages for positive breach of contract if we are only held liable for negligence. In the event of gross negligence, our liability to ordering parties who act as registered traders is limited to the provisions of paragraph XI. 1. para. 2. These terms and conditions include all claims for withdrawal, reduction or refund which the ordering party is entitled to. Claims which are not mentioned in the terms and conditions are excluded, unless an imperative legal right outlaws the exclusion. The place of performance for all obligations deriving from a contract of delivery is Berliner Str. 42, D-58135 Hagen, Germany. Place of all disputes which may occur from the delivery contract with businessmen or with institutions incorporated under public law, especially such from bills of exchange or cheques, are to be ruled in Hagen (Westphalia), Germany. If a provision of this Agreement is or becomes illegal, invalid or unenforceable in any jurisdiction, that shall not affect the validity or enforceability in that jurisdiction of any other provision of this Agreement; or the validity or enforceability in other jurisdictions of that or any other provision of this Agreement. The invalid provision has to be interpreted respectively changed in a way which made it possible to aim the foreseen economical success. If this is not possible then the affected provisions have to be replaced with provision according to the law. The terms, sale conditions, conditions, policies, use or other are subject to change without notice. Even with a thoroughly review of the sales conditions may still have mistakes, misspelling or other and are subject to changes without further notice.